VeChain has recently released their beast of a whitepaper, which allows us to re-assess our expectations on returns following the launch of their mainnet, as well as guide our thinking regarding similar projects. We specifically focus on token economics and VTHO, and how everything ties back into VET. In part 1, we make an attempt at trying to guess the value of a transaction, and what it would mean for returns in the short term. In part 2, we take a look at general factors beyond VTHO that could contribute to the growth of VET price. TLDR’s are available at the end of each sub-section for those who want to skip the math. With the recent release of the whitepaper, it’s time to revisit VeChain’s economic sysytem. The VeChain ecosystem uses a two-token model. The VeChain Token (VET) generates VeThor (VTHO), a consumable token which serves the same function as gas in the Ethereum ecosystem. The total pool of VTHO is meant to cover all forecasted transaction costs (i.e. VET transfer) and smart contract activity. Moreover, the price of VTHO, while prone to market fluctuations, is meant to be relatively stable, which is an assumption we’ll make. To this end VTHO’s generation rate, or velocity, can be changed by the VeChain foundation to prevent unwarranted price increases over long periods, which dampens VTHO’s ability to appreciate. One way to think about this model is that VET generates a tradable credit for their owners to access the VeChain ecosystem. The brilliance of this can be seen with the recent spike in Ethereum gas prices, with the safe low gas price going from 2–3 gwei up to 10+. Unstable transaction costs can be a huge sink, especially for people looking to execute a lot of transactions or contracts. In the subsequent sections, note that calculations may have 5–10% rounding errors. Also, calculations assume that there are no node bonuses. Moreover, assumptions will be noted and massively abused. Currently, the total supply of VET is 867,126,344. Following release of the mainnet, VET tokens will be exchanged for mainnet coins in a 1:100 ratio, resulting in a total supply of ~87B VET. From the whitepaper, we know that the initial base rate of VTHO generation is 0.000432 VTHO/VET/day or 0.15768 VTHO/VET/year (interestingly, this has been increased from 0.00042 VTHO/VET/day). With the current numbers, the total amount of VTHO generated per year from VET is 13,672,848,202 or 13.7B. It then becomes a simple matter of distribution based on node bonuses (current bonus VTHO generation is allocated from the VeChain Foundation’s reward pool, which consists of 15B VET for economic node holders and 5B VET for x-node holders). We also know that Authority nodes get 30% of spent VTHO as a reward, while the remaining 70% is burnt. Assuming we burn through the total supply of VTHO in a given year (13.7B), along with everything re-generated, we can estimate that the effective total annual supply is around 19.5B VTHO (13.7 * (1 + 0.3 + 0.09 + 0.027 + ….)). Naturally, this assumes that VTHO generation rates do not change, which is unlikely in the long run, assuming adoption. Let’s round this off to 20B to make things simpler. For the sake of curiosity, we’re going to try and estimate the cost of transactions and the value of VTHO tokens. In trying to estimate the cost of a transaction, we will first take a look at a VeChain partnership announcement. TLDR: Approximately 13.6 billion VTHO will be generated annually by VET. Assuming that everything is used and re-used every day, roughly 6B VTHO can be “regenerated” via Authority nodes, which recycles 30% of spent VTHO. This results in a maximum annual supply of ~20B VTHO per year, given the current rates. Back in January 2018, there was an announcement of a Mlily partnership. In the article, it mentioned that Mlily is looking to purchase at least 20M RFID tags annually over the next 5 years. According to Google, Mlily’s revenue was roughly $400M USD over the 4 quarters ending March 2018. VeChain’s RFID/NFC tags can range from several cents for normal security levels (mentioned by VeChain founder, Sunny Lu, at November Tokyo meet-up) to a little over $1–2 USD per tag for advanced protection (e.g. used in authenticating luxury handbags). While there are more expensive tags, it appears that those are meant for repeated/unlimited use for real time data acquisition (e.g. temperature trackers), so it’s unlikely to be utilized in this context. Looking at extremes, if all 20M tags were a few cents, we’d be looking at expenses in the ball park of $1M USD (assuming $0.05 USD/tag). If all 20M tags are of the $1 USD variety, the cost would come out at $20M USD. The odds of it being at the lower end is much higher, so total spending in the $2M — 7M range could be reasonable, which would mean an average cost of $0.10 — 0.35 USD per chip (i.e. a mix of cheap and expensive tags, skewed towards the cheaper end). With a range for chip spending, we can now take a look at transaction costs. Let’s start by assuming that transaction costs total to around 10% of hardware value, which results in a range of $200K — 700K USD. Let us build in some leeway and round the upper limit to $1M USD (around 14% based off of $7M USD or 0.25% of Mlily’s total revenue). Likewise, we’ll also set the lower bound to $100K (around 5% of $2M USD or 0.025% of total revenue). With 20M chips, we would be looking at each chip performing an average of $0.005 to $0.05 USD in transaction costs over some number of transactions. If each chip triggers more than one transaction or smart contract, there is a high likelihood that the average cost per action would go below $0.01 USD. This seems reasonable, given that VeChain is targeting Internet of Things and going for the high volume low fee route, as stated in their AMA series. Could the average cost be higher? Maybe 1- to 2-fold higher could be possible, but anything higher is probably unrealistic. As it stands, our estimates put us at $2.1M — 8M USD/year spent on chips and transactions. Such a scenario may be possible if we are looking at supply chain accounting for ~10% of revenue (e.g. $40M USD), with savings in the range of 5–20% ($2–8M USD). This also assumes that the solution will be rolled out across Mlily’s entire system, or at least a significant portion, and that all revenue is linked to its operations. To help in adding some extra perspective, according to a McKinsey report, supply chain costs account for roughly 5–6% of sales on average, with variation between different industries. This would put our supply chain spending at an above average level. To give an idea on savings, Samsung is looking at 20% cost savings in supply chain costs if blockchain solutions were to be implemented. Granted this should be taken with a grain of salt, as different industries could achieve significantly different figures. The main point is that cost savings and efficiencies for the company has to be considered, and some levels of spending are just simply very unlikely without additional factors. However, it is important to keep in mind that complex smart contract interactions (e.g. triggering insurance payout for bad shipment) may cost significantly more to execute. Admittedly, the reverse is also true, wherein all tags have a probability of triggering an action that is dependent on their use case, so a large number of tags may not trigger a large number of transactions. Either way, transaction costs in the range of $0.01 to $0.05 USD seems like a reasonable range when assessed in conjunction with the cost of the tags and total revenue. An increase of our upper limit to $0.10 or 0.15 USD from $0.05 USD would result in an additional $1M — 2M USD in transaction costs, which would put costs on the higher end. TLDR: Mliliy is looking to acquire at least 20 million tags per year from VeChain. Based off of Mlily’s revenue being around $400 million USD, and after accounting for costs, we estimate that each tag will perform an average of $0.01–0.05 USD in transactions over some number of transactions (i.e. 1 or more). After some light rounding, we now have a spending range of $0.01 to 0.05 USD/tag. Being part of a supply chain/traceability solution, in all likelihood, our estimated fees will be a combination of multiple transactions, which would suggest that the cost per transaction would probably lie below $0.01 USD. If we use Ethereum as a reference point, where a typical transaction (21K gas) costs several cents to ~$0.20 USD depending on gas price (using May 2018 as a reference month), it is not an unreasonable upper boundary, given VeChain’s philosophy of high volume low cost transactions. So for argument’s sake, let’s use a range of $0.001 — $0.01 USD/transaction — it could be lower, but unlikely to be too much higher, given our previous assumptions. Although we could have arrived at this transaction value range based solely off of Ethereum’s price structure, the previous analysis using Mlily serves as an additional test of sanity. From this, we know that the gas price would range from a minimum of 21 VTHO to a maximum of 42 VTHO. Using the minimum bound of 21 VTHO per transaction, we can then conclude that a single VTHO is going to be dirt cheap ($0.001–0.01 USD/21 VTHO). TDLR: Based off of our understanding of Mlily’s partnership and Ethereum’s cost structure, we think that a single transaction will cost between $0.001–0.01 USD. In addition, each transaction will cost a minimum of 21 VTHO, so each VTHO will be at most be valued from $0.001 USD/21 VTHO to $0.01 USD/21 VTHO. We know that VTHO’s velocity is going to be 43.2 VTHO/100K VET/day. Assuming that we reach a stable price defined by our previous range of $0.001–0.01 USD/21VTHO, we would generate $0.0021–0.021 USD/100K VET /day or $0.75–7.51 USD/100K VET/year. Currently, pre-split, VET is between $4–5 USD, which translates to $0.04–0.05 USD/VET or $4K — 5K USD/100K VET. Using a price of $4.5K USD/100K VET, we will get yields of .02% — .2% (reminder: this excludes node bonuses). Probably not what people are looking for in terms of yield. However, we need to remember that these figures pertain to the initial roll out of the platform and will unlikely reflect long term rates. This comes out to roughly $950K– 9.5M USD for the VTHO market cap, which is extremely low, seeing as our estimates for Mlily alone takes up a good proportion of this value, and it isn’t even the largest partnership. A dive into partnerships is well beyond the depth of this piece, so we’d like to re-iterate, once again, that our current parameters are just for the initial stages of the platform. As more roll outs happen over time, which we fully expect, we are likely to see an increase in generation rates and total VTHO market cap. Note that we have used the term “transactions” to specifically refer to actions that cost 21K gas and assume that the whitepaper’s usage of the term is similar. This definition would exclude smart contracts, which can cost several fold more gas, depending on complexity. This would significantly reduce the amount of “available transactions per day”, barring VTHO price increases or a change in some other parameter. 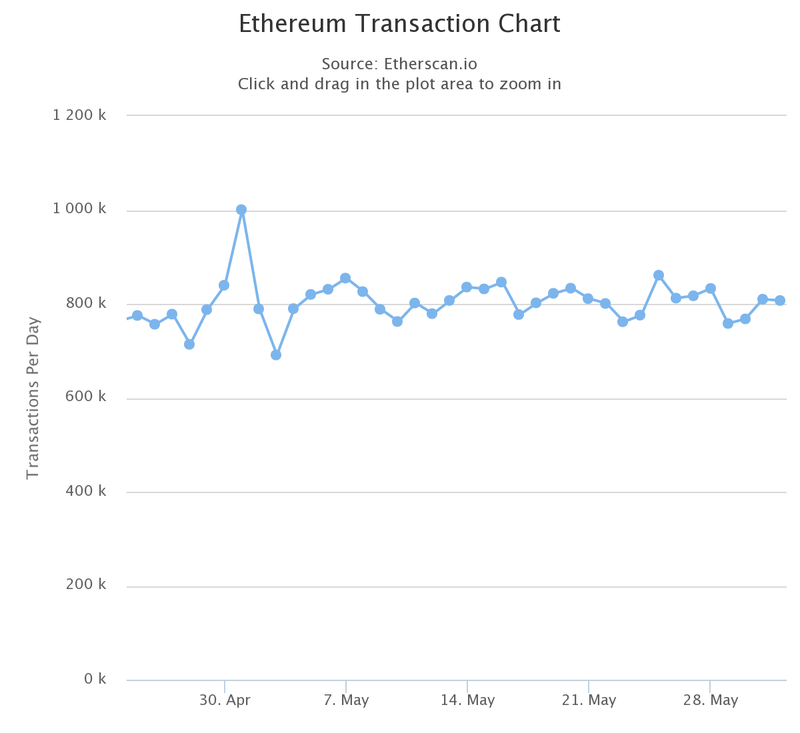 Now let’s add some perspective to the numbers above by comparing against Ethereum once again. 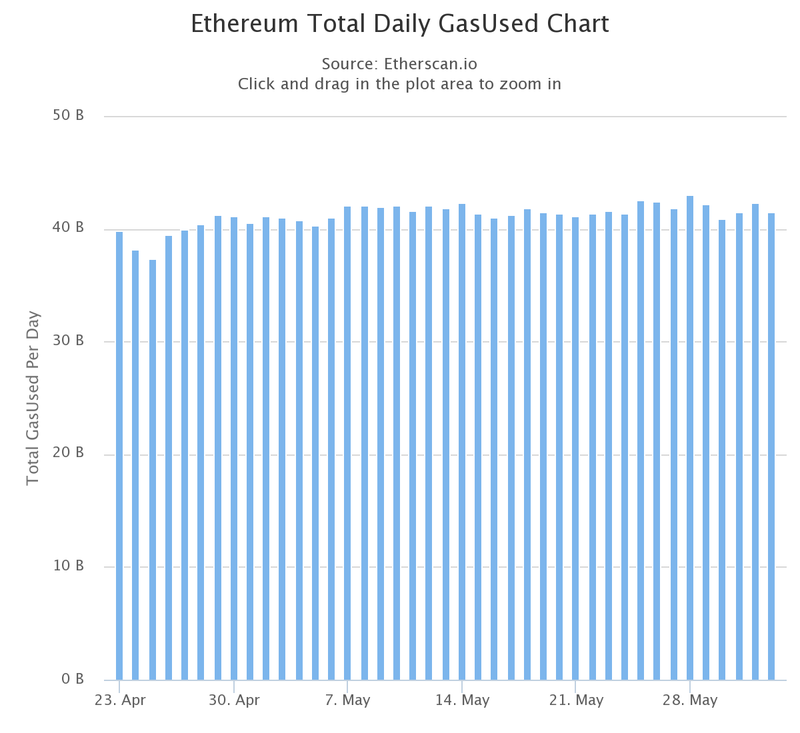 Since the beginning of May 2018, according to Etherscan.io, the Ethereum network has been processing roughly 800K transactions daily, with total daily gas expenditure sitting at around 40B. This averages to 50K gas per transaction. Now, if we then redefine transactions as smart contracts + payments and use Ethereum’s average of ~50K gas (versus their standard of 21K gas transactions), this would reduce our effective “available transactions” by 2.5X, leaving us at an equivalent of 12 TPS. Interestingly, this is in line with Ethereum’s TPS. We can then scale our observation to test earnings at different levels, for example at the equivalent of 10K TPS. This would need an increase of ~800X, resulting in $0.006–0.06 USD/VET and a total VTHO market value of $760M — 7.6B. A point to note is that while VTHO shouldn’t really be considered a “dividend”. VTHO essentially provides holders a certain share of the market for network transactions, which we believe may only constitute a (relatively) small percentage (i.e. small yield) of VET’s total value, even as we scale up network activity. We will explore this in more detail in the second part. TLDR: Returns will likely be terrible initially, but will hopefully scale up as more partners are rolled over from the private consortiums to the public chain. Even so, there is a likelihood that the price of VET will not be in-line with VTHO generation even in the long run. Given the INITIAL parameters for VeChain’s platform and a perfectly efficient system, we are looking at almost 20 billion VTHO being generated annually — 13.6 billion VTHO comes from VET while 6 billion VTHO can come from continuous re-cycling by Authority nodes. From taking a look at Ethereum and one of VeChain’s partnership, we think that $0.001–0.01 USD could be a reasonable price per transaction. With a minimum cost of 21 VTHO per transaction, an individual VTHO wouldn’t really amount to much. But it’s important to remember that the network will grow over time as more partnerships are onboarded and/or rolled out. Even then, we wouldn’t be surprised if VTHO payout makes up only a small percentage of VET’s overall value, which we will explore in part 2. PS: Part 2 can be found here.